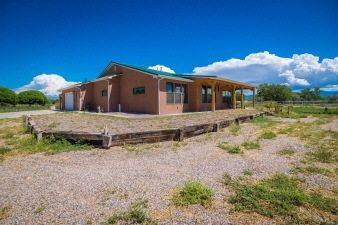 Description: This beautiful custom-built home is located in los chavez on 1.5 acres of irrigated land. Enjoy the energy efficiency of the 11" exterior walls. Light and bright floor plan with 3 spacious bedrooms and 1-3/4 baths. Gorgeous kitchen w/6-burner cook top, pantry, large breakfast bar/island, granite counter tops, tile backsplashes. Luxurious master suite has walk-in closet, huge bathroom with double custom sinks, granite counter tops & fabulous walk-in shower. Radiant heat in floor and gas forced air furnace. Refrigerated air conditioning will keep you cool all summer long. Bring your animals--this property is completely pipe fenced and cross fenced & has pole barn with horse stalls. Oversize 2-car garage plus a 2-car carport. Natural gas and reverse osmosis water system. Hurry to see this well maintained home!